If you came to this page directly, you might wish to read a page with an introduction to this section or page one first. It had been our intention to go from Città di Castello to Gubbio, which to ideas formed only from study of the map seems to be a very simple matter. The distance in a direct line may be some sixteen or eighteen miles; certainly not more. But a very short conference on the subject with the authorities of the stable sufficed to dispel from our minds all such agreeable illusions. Go to Gubbio! 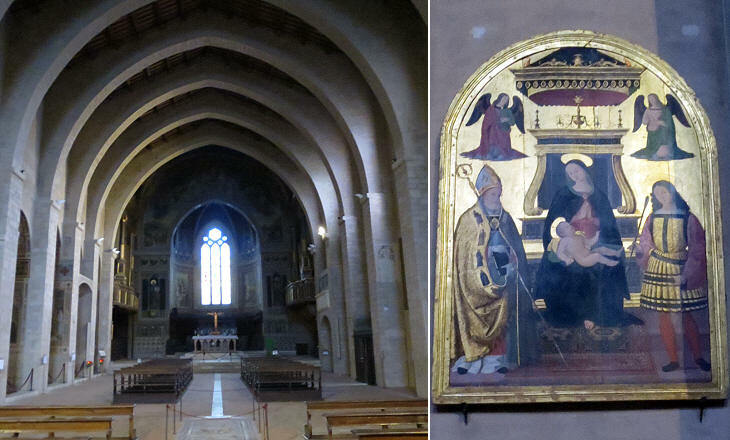 In the first place, what business could any one have to go to Gubbio at all? 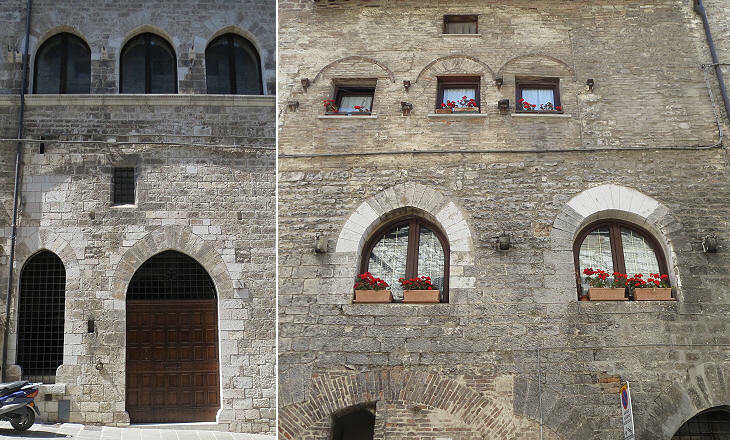 Everybody went from Citta di Castello to Perugia! That was the regular course of things, and the law of nature! After that they might go to Gubbio, or whithersoever else might seem good to them. There was no road to Gubbio! Nobody had ever attempted such a thing. 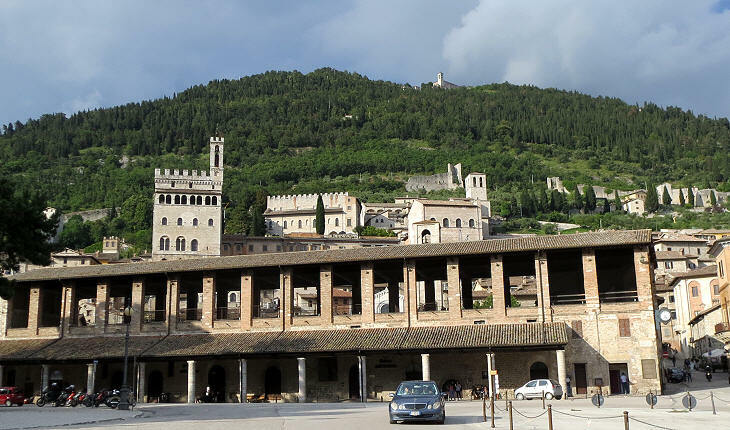 The isolation of Gubbio from the main roads explains why few Grand Tour travellers wrote about it. 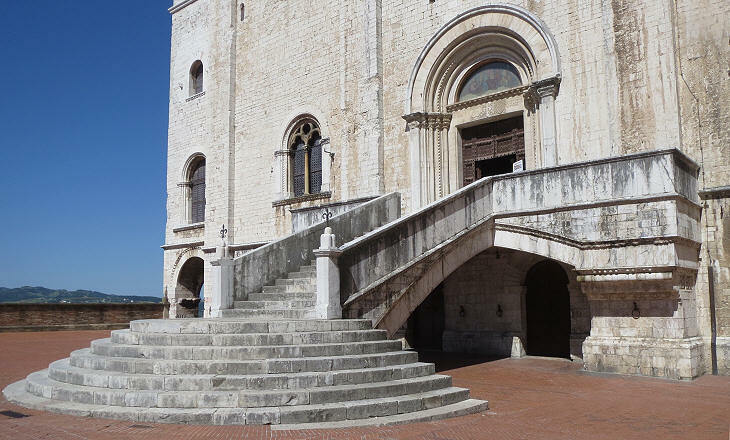 The XIIth century expansion of Gubbio on the slope of the hill (see page one) led to the relocation of its Cathedral to a new building on a commanding position which made it more visible from afar. Today there is almost no space in front of the Cathedral, but probably before the construction of Palazzo Ducale (see page three) the façade was preceded by a small square. 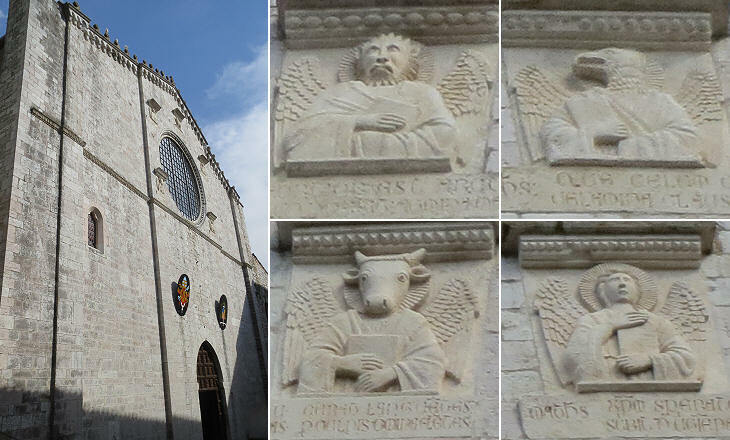 Similar to many other cathedrals, including those of Assisi and Spoleto, the rose window was decorated with the symbols of the Evangelists, but quite unusually the eagle, the bull and the lion were humanized. Perhaps because of the isolation of the town the design of the interior of the Cathedral does not follow traditional patterns, but was developed locally. It has only one large nave with the roof supported by ten cusped arches. It is a very daring construction technique which shows the engineering skills of the local masons. Small niches between the arches were used as chapels and have interesting works of arts on their altars. Some later additions have been removed to enhance the medieval aspect of the church. The wealth of a Comune (Italian city-states which flourished between the XIth and XVth centuries) was measured by the size of its Cathedral and by that of its Town Hall. 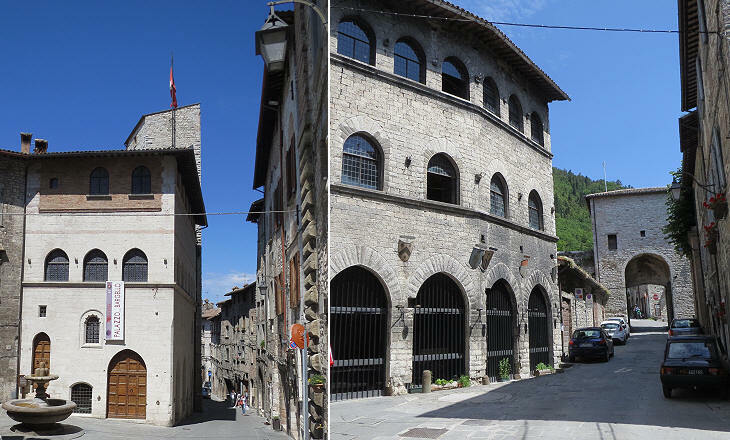 The size of Palazzo dei Consoli may not be comparable with those of other medieval town halls, but when one includes in the building the substructures which support it (large vaults having a height of 20m/66ft) its total size is very remarkable. A large piazza was a facility required by the government system of the Comune which was based on magistrates usually appointed by the town guilds, but some decisions had to be endorsed by the whole population and this required a large piazza (you may wish to see Piazza Aringo at Ascoli). Palazzo Pretorio which was to house tribunals and other public offices of the Comune was never completed because Gubbio lost its independency in 1354 when Cardinal Gil de Albornoz restored papal authority. Palazzo dei Consoli was built in 1332-49, a relatively short period of time. It was designed by Angelo da Orvieto with the assistance of Matteo Gattapone who was involved in the complex technical design of the building and of its supporting structures. Gattapone was in charge of the construction of Palazzo Pretorio when Cardinal Albornoz commissioned him the Castle of Spoleto and the bridge/aqueduct of that town. Today the building houses the Civic Museum with exhibits from the various periods of the town's history. Tavole Eugubine is a very interesting document on the early civilization of the region. They are seven bronze tablets, all of them written in the language of the Umbri, the first inhabitants of the region. Five are written in the Umbrian alphabet and two using Latin alphabet. The text deals with religious ceremonies and sheds light on the ancestral Italian deities. Because the Museum has a strict copyright policy and does not allow non-professional photographing you may wish to see them in Wikipedia (it opens in another window). The Comune government system varied from town to town and it changed through the centuries. One thing it had in common with the ancient Roman Republic is that power was distributed among a plurality of institutions. It was a way to allow the different components of the population to have a say in the government of the town. Bargello indicated a military leader, but more a chief of the police than an army commander. Often the residence of the Bargello housed the prison of the town. Capitano del Popolo was usually a representative of the merchants or the guilds, and in general of those who did not belong to noble families. In some Umbrian towns this magistrate wielded enormous power as at Perugia and Orvieto. In 1151 Gubbio was sieged by an alliance of eleven Umbrian towns and it managed to avoid disaster thanks to the prayers of St. Ubaldo, its bishop (see page one). The town however did not rely on divine protection solely as it was well protected by walls and towers. 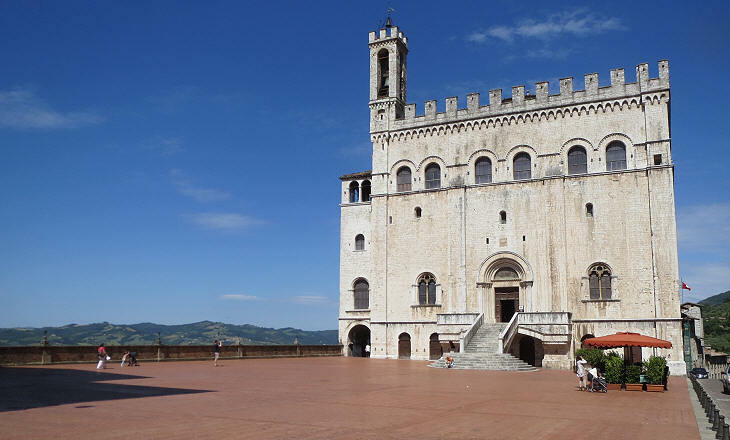 Because Gubbio lost its importance in the XIVth century they were never upgraded and they retain their medieval aspect. 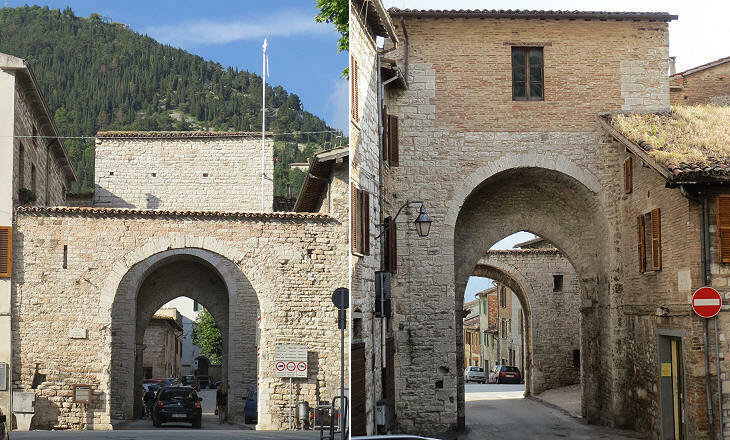 Porta Vehia, a gate of the ancient Umbrian town, inside the medieval enclosure and near Porta Romana, was probably used to block access to the upper town to enemies who had managed to seize the latter. Other gates were strengthened by building a second gate in front of them. This had the advantage of limiting the number of enemies who could assault the main gate. 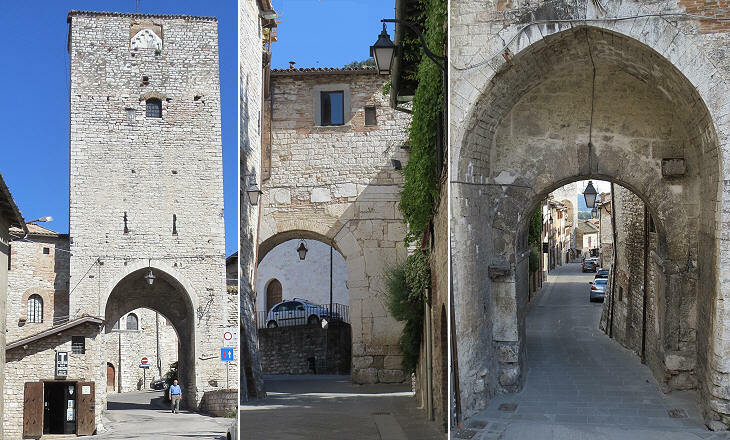 With the exception of the main road access to Gubbio, the walls still surround most of the town. You may wish to see a view of them in page one. In 1960 representatives of many Italian towns and art historians met at Gubbio and issued Carta di Gubbio, a summary of directives meant to preserve the historical centres of Italian towns. The document outlined the need to retain the overall traditional urban design, rather than caring for the main monuments only. 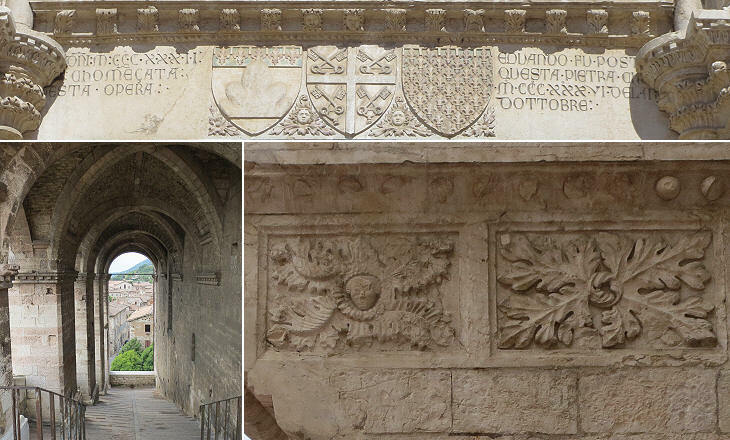 The document did not have a binding power, but at least at Gubbio its suggestions have been fully complied with and the town has a consistent medieval aspect (and this without horrid medieval-looking modern buildings). The restoration of papal power by Cardinal Albornoz in Gubbio and in the whole of Umbria did not last for a long period, because of the crisis known as the Great Schism. 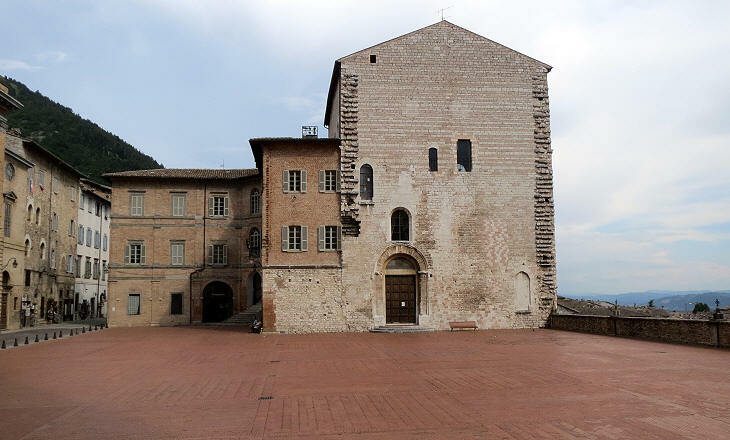 The popes however, in order to retain some form of control over the rebellious Umbrian towns, assigned authority to local powerful families (at Gubbio the Montefeltro - more on them in page three). 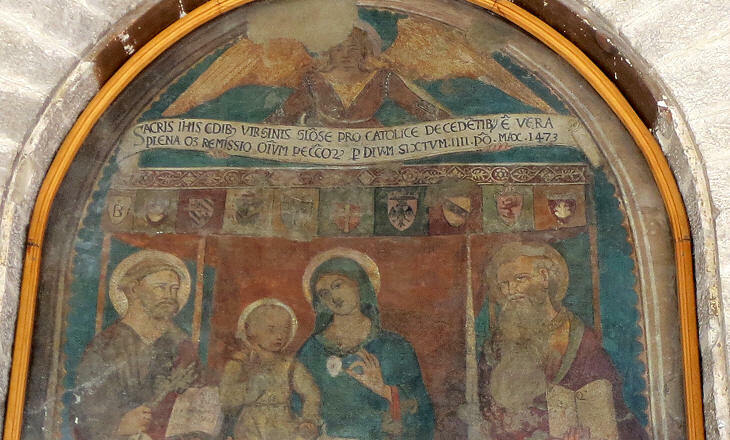 The fresco shown above could not have been painted in the heyday of the Comune, because no one would have liked to see the symbol of Gubbio (far right) next to that of rival Perugia (a gryphon).